Floating cranes are playing an increasingly important role in ship- to-ship and ship-to-shore bulk loading, unloading and transshipment of numerous cargoes. Because they require no port infrastructure, floating cranes are flexible and can operate within or outside of ports. The importance of floating cranes is particularly being driven by port charges and bulk carrier size. Higher port charges are generally causing operators to reconsider their loading and unloading operations, moving them away from the quayside. Larger bulk carriers and the resultant deeper draughts mean that the ports need to be deepened or the bulk carriers must lighten their cargoes before entering port. Due to their flexibility and high throughput capacity, NKM Noell’s lemniscate floating cranes are increasingly used in the Netherlands to unload grain but also to transship cargo from bulk carriers into barges for further shipment. For handling light and free-flowing materials grabs are used with high enclosed shells to minimize material loss and environmental pollution. The grabs can be equipped with overlapping under knives to minimize spillage even further for the finest materials. The enclosed scales are minimizing the influence of the wind on the material inside the grab. The upper side of the scales are provided with steep plates that are open at the top. The advantage of the steep plates is that materials are not compressed against these plates that are open at the top. The open upper side of the grab ensures the crane operator of a good view into the grab. By doing so he can check the filling of the grab.This is especially important during cleaning up. swinging. This both results in very short cycle times and high capacities. Especially during bad weather conditions (fog, rain) and during night time and joint operations with shovels in the hold. The excellent operator visibility results in a lower capacity drop in adverse conditions. 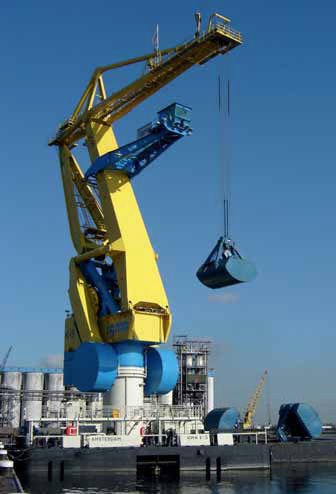 In general reliability, availability and the crane’s lifetime are key aspects in the design. Essentially, the crane must be economical to operate and be environmentally friendly. In this respect, one optional design feature of the NKM Noell floating crane is the use of a flywheel to ‘charge’ the generator-sets located in the pontoon. The flywheel itself is ‘charged’ using regenerated energy from the movement of the grab. NKM Noell Special Cranes GmbH is a leading supplier of special cranes and special handling equipment. In addition to advanced special cranes, it can also supply R&D, consulting, feasibility studies, design, engineering, manufacturing, shipping, installation, commissioning, training and after sales service.